Stones measure 6" x 2"
SAVE Over $50 Off List Price! This Special 6" DMT Diamond Kit in Wooden Box is the Least Expensive Way to Purchase all 4 Grits. 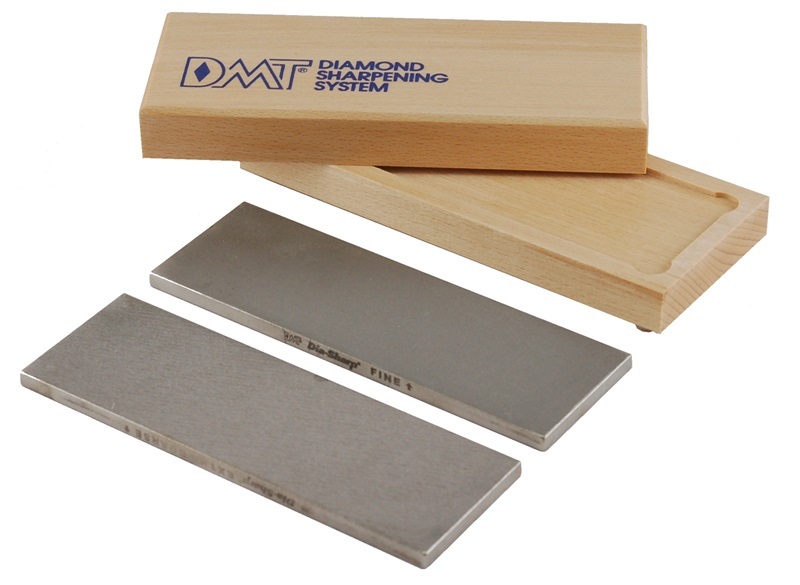 This DMT 6" x 2" Dia-Sharp Diamond Kit is a tremendous value. It includes 4 grits (Extra Fine/Fine and Coarse/Extra Coarse) on two double-sided stones and a free hardwood base. We’ve never offered all 4 DMT Diamond Stone grits at such a low price before. Each grit has a purpose so we felt it was important to offer them all at a reasonable price. Extra Coarse - Use to repair and restore damaged edges, this is very fast sharpening. Coarse – This is also fast to sharpen and will quickly refine a dull edge. It is used after the extra coarse. Fine – This grit will really start to put a keen edge on your knife or tool. It is used after the coarse. Extra Fine – The extra fine is the last step in creating an edge. The edge will be significantly sharper after this stage. This is a very fine stone, don’t use it on dull edges (use the other grits for dull edges). This kit eliminates one of the most common sharpening mistakes (only getting 1 or 2 finer grits). The "wisdom" of this mistake goes something like this, "you can save a few bucks by only getting a fine stone because you can just spend more time on the fine stone." In theory it is somewhat true but in real world situation it is a bad practice for two reasons. First, an extra coarse stone sharpens much faster (more than 10 times as fast) as a fine stone so you can maintain your angle easier over a shorter number of strokes with the extra coarse. Second, asking a fine stone to do the work of a coarser stone will put unnecessary wear on your fine stone (defeating the long term savings of omitting the coarser stone purchase). The pricing of this kit will encourage even the most ardent penny-pinchers to reconsider their position. The Dia-Sharp stone feature DMT's continuous diamond surface. This means the entire stone is covered in diamond. This surface allows you to sharpen pointed tools without any chance of catching it the recesses of an interrupted diamond surface. Unlike larger 8" stones, the 6" stones are intended to be more for the space and value conscious. If you have a set of pocket knives, the 6" size is plenty large. 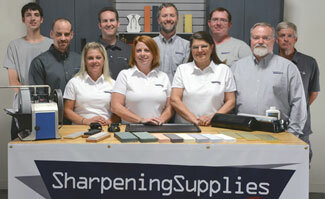 If you have larger knives or tools, we recommend the larger 8" stones. The wood case is a great additional feature of this kit. The case serves two purposes. The first is to keep your stones safely organized when not it use. A spacer is included to keep the stone nested without rubbing together. The second is to act as a base for sharpening. The bottom of the case features four rubber grips so your stones will be well secured while sharpening. The base also lifts the stone up off your table for extra knuckle clearance when sharpening knives. This kit contains quality DMT Diamond Stones. These stones are made is the USA. Don’t let the price fool you, these are high quality stones. All stones made in the USA. Q. What are the options for individual 6" Dia-Sharp stones? A. The 6" Dia-Sharp stones are available individually in both double sided and single sided varieties. For other frequently asked questions see our DMT and Diamond Stone FAQs.